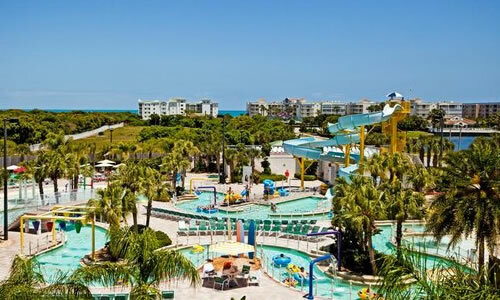 Ron Jon Cape Caribe Resort is a beautiful resort located between Port Canaveral and Cocoa Beach, Florida! Come and enjoy the Caribbean atmosphere while you and your friends take a floating tube on a Lazy River ride. Sunbathe around the heated pool; feel the rush of the 248-foot-long water slide; invigorate yourself with the exercise room, tennis courts, basketball courts, and hot tub! Play a round of miniature golf, shuffle board, or have fun at the beach. See a movie in the theater, or relax in the restaurant and lounge. Whatever you and your family choose to do, your stay at the Ron Jon Cape Caribe will be thoroughly satisfying! Shuttle service is offered from the main building to the on-site beach.